Strange Tag Behavior with Ford SYNC? I recently bought a new vehicle (2019 Ford F150) and, of course, no CD player anymore, so I've been ripping my CDs and fixing the tags on my MP3s so everything doesn't show up and "unknown". For the most part it seems to be working OK, but I've notice some peculiarites. I have an Artist: "S.O.D. (Stormtroopers of Death)" and for good measure, have Album Artist set the same. It comes up fine in VLC. In the truck, it comes up as "Stormtroopers of Death" , no, "S.O.D." or brackets. In an attempt to group sountracks, I've set both Artist and Album Artist to "Soundtrack" and the Album to the movie title. "Soundtrack" doesn't show up in the artist list. Going to change to "Sound Tracks" to see if that works better. The movie Evil Dead 2 for some strange reason comes up as "Sneakers (Soundtrack)" . No idea where the word Sneakers came from. Can't find it anywhere in the tag with MP3TAG. The tags all show up as ID3v2.3 (ID3v1 ID3v2.3). This is using a USB key. Thoughts? Is there something I'm doing wrong? So I changed "Soundtracks" to "Sound Tracks" and that seems to appease the indexer. Evil Dead II is no longer showing as having an artist of "Sneakers (Soundtrack)", but Gladiator is now. Changed the format of "S.O.D. (Stormtroopers of Death)" to "Stormtroopers of Death (S.O.D.)" just to see what it does. It also seems to play in alphabetical order, but not all the time and not consistently, so I set up a couple tests. One with a playlist and another with adding a number prefix to the Title. Another weird one. Albums with multiple disks. In the truck, if I browse to Slayer, in the albums, I see "Decade of Aggression [Disk 2]" (The date prefix stripped off, but it kept the Disk 2 postfix. All 21 tracks, BUT, with the first track of disk 2 (201 - Hallowed Point.mp3) first on the list. So it seems to be doing some bazaar combination of reading the tags and physical locations. In the Artists list in the truck, it shows up as all upper case, "BABYMETAL" and I have no good explanation for that. One of the paths was all upper case at one point, but I've fixed that. It must be caching something and not clearing it between indexer runs. If it's not going to read standard tags, like Track Number, what's a point of indexing it at all? It take something like 15 minutes every time I plug it in. It appears it was Gracenote. Disabling it fixed most of the issues, with the exception og Gladiator not grouping properly with the other soundtrack. Not wure what that's all about. Maybe a corrupt tag. I'll try removing them all and readding them. So it's a setting in the player? 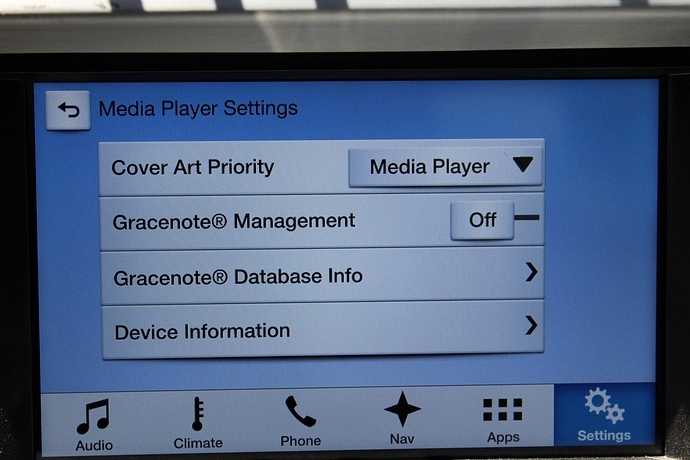 There is a toggle in Media Player Settings to turn Gracenote Management off. The Gladiator issue appears to have been a corrupt tag. Redoing the tags seems to have resolved the issue. With that, all of the above issues appear to be resolved, though more thorough testing is required to make sure things like playing in the correct album order are actually working properly now. I'm not sure what Gracenote was doing. Perhaps it's just not well supported in Canada. Perhaps I'm just too picky and want the player to do unrealistic things.